Every year, over 15,000 fires are caused by lint buildups in clothes dryers. All of those fires could have been prevented with regular cleaning of the dryer vent. A clean dryer vent also prevents costly energy loss due to poor venting, and prevents overheating conditions in the dryer itself. We are happy to offer dryer vent cleaning service and offers special discounts when you combine dryer vent cleaning with a duct cleaning. Protect yourself against disaster and get the most from your dryer. Contact us today! Proper airflow venting can decrease drying time and decrease operating costs. Full airflow helps prevent the dryer from operating on its high temperature safety limit control. Vinyl and foil duct venting materials can easily collapse when installed. The use of proper venting materials to achieve maximum performance may also extend the life of the dryer and increase the life of clothing due to lower drying temperatures. A key to effective dryer performance is optimal airflow. A properly installed all-metal dryer vent will help ensure this airflow. Cleaning your clothes dryer exhaust duct is an important service. This is a service that is often overlooked and can cause water damage, possible fire hazard, health risk, higher electrical costs and even damage to your clothes dryer. When a dryer duct becomes plugged you are more likely to experience moisture or water damage. This moisture or water may or may not be visible to you. 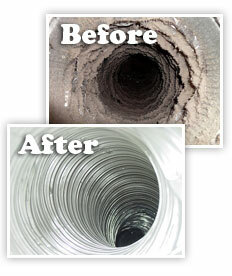 We commonly retrieve 2-5 gallons of lint, from dryer ducts when we clean them. Reduced airflow and the resulting lint build-up cause overheating . Most high temperature limit switches were never designed to cycle on and off continuously which can cause them to fail over.